I have some really exciting news to share on this lovely Valentine's Day...it's twofold, really, because 1.) I am now happy to be a part of the Papertrey Ink family as a member of their Moments Inked Promotional Team (!!!! ), and 2.) PTI is jumping head first into the Planning market! 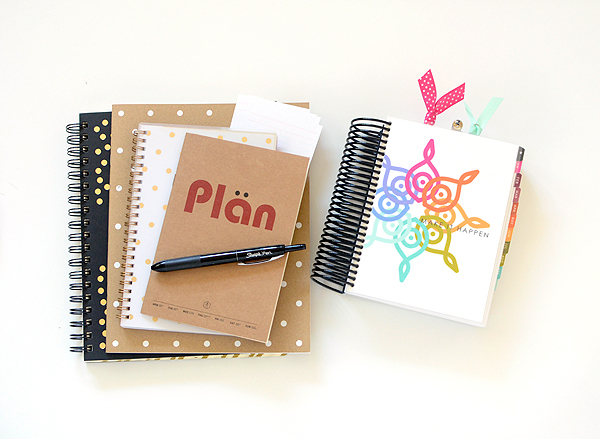 For awhile now, I have been searching for a simplified planner that will work with a busy schedule full of due dates--design team work, creative collaborations, Etsy shop releases, blog posts, etc. I've mostly been storing all of my dates to remember in my head--yup, that's right, my head. Along with index cards and keeping important emails filed on my phone, I rely on my brain to do the rest. It's not pretty and nowhere near organized, so when the opportunity arose to try out the PTI Moments Inked Planner System, I jumped on board! 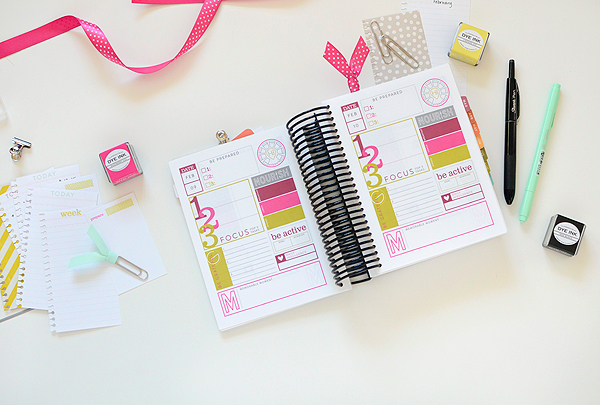 I've been searching for a planner that has the month-at-a-glance, week-at-a-glance, and a page for each day. To say I was happy that the MI planner has each one of those things is an understatement. I happen to be mutually following quite a few "Planner Girls" on Instagram so as I'm scrolling through, I see so many different kinds of date books and organizers. Having seen so many on IG, I really wasn't expecting the Papertrey planner to look quite like it does...that is to say, it is THICK! Let's face it, though, it's difficult to do a page-per-day book without some girth so I quickly got over my initial shock once I began to thumb through it. It's thick, but at a 5x7 scale, it's petite, or well, stocky might be more accurate!! But trust me, there is A LOT packed into one notebook-style organizer. 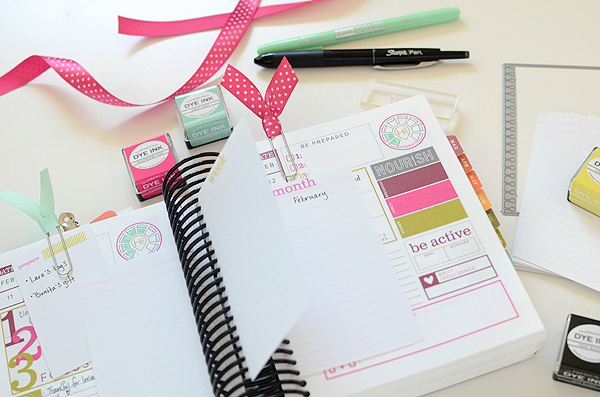 - The planner itself is spiral-bound with color-coded monthly tabs for quick reference. - It will retail for $45, which is mid-range, and seems like a great deal to me for all that can be done with it. - The system has coordinating dies and stamp sets (sold separately) that allow you to fully customize this book to YOUR lifestyle. 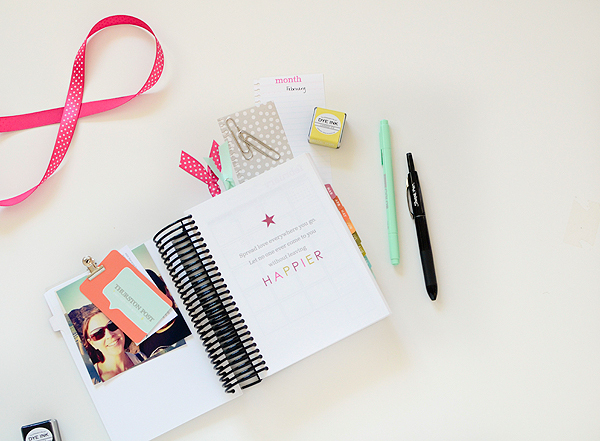 With the dies, you can add pages, make banners, page flags, and sticky notes. 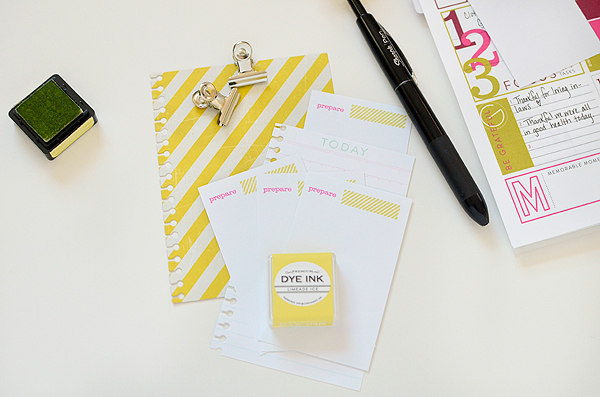 The stamp sets cover pretty much everything you could think of: appointments, reminders, memory keeping, and there's even a set just for bloggers (which I love!). And, of course, there's more to come with future releases. 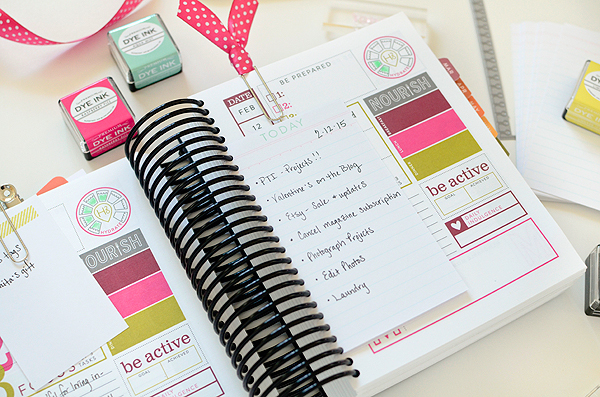 - The linen pages are not your average planner pages. They are elegant (but not stuffy), yet thin and with a hint of texture. They are a dream to write on--it was difficult to make my first pen mark in this book for fear of interrupting it's perfectly pristine pages! - If you love color like I do, you will not be disappointed here. 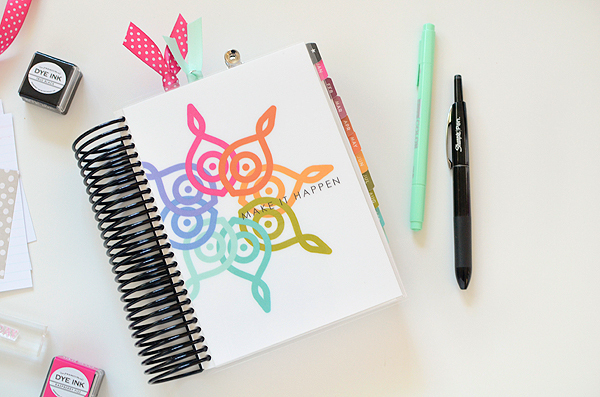 Papertrey's colors are saturated and vibrant and somehow all coordinate perfectly with each other and it's no different here in this planner. 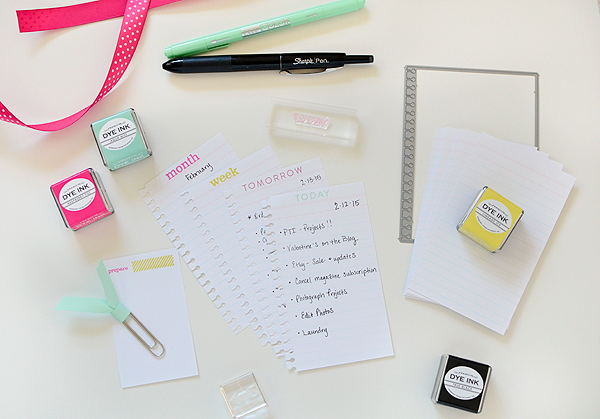 Each month is a different set of lovely colors which makes it really easy (and fun) to customize the add-ins. There is a choice of 3 different covers and it's my understanding that more will be offered in the future. I chose the 'Make It Happen' cover because I hope to bring about some positive changes and achieve a few milestones this year. It is also the most minimal cover (lots of white space), which will be my approach to planning this year. Here's a look at the month-at-a-glance spread, which I find so helpful when looking ahead. Holidays and observances are noted, and I've decided to lightly color in the number box of each day that has passed so I know exactly where I am in the month and how far away (or near!) my next deadline is. There's room for one or two short notes each day and a sidebar for the major happenings and projects. And here is the week-at-a-glance. 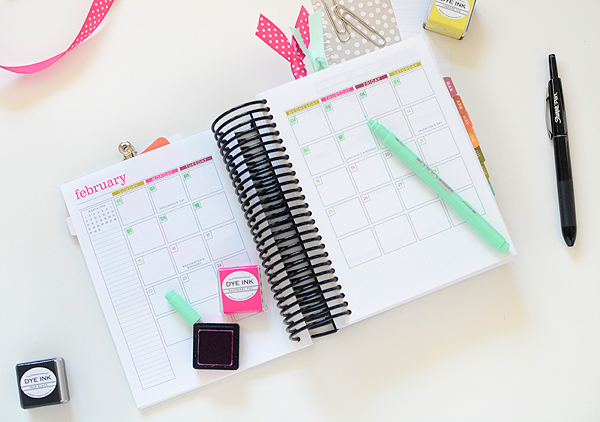 While there isn't a ton of space to write things down (but keep in mind there is an entire page for each day), it's the perfect spot to keep track of the week's appointments and due dates. Each day has a small notes section under it and because there is a blank column on the left page, I can add important reminders there. 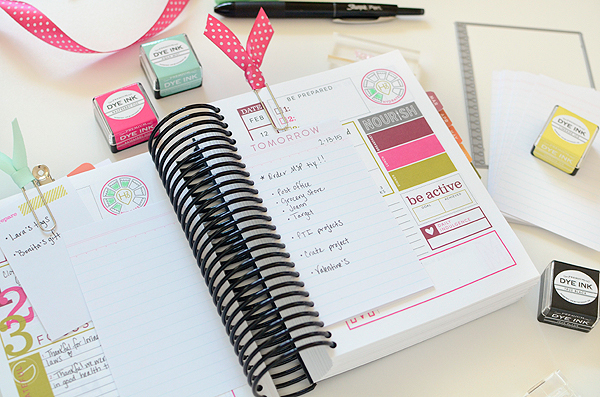 My own approach to planning will be keeping it simple--minimal. 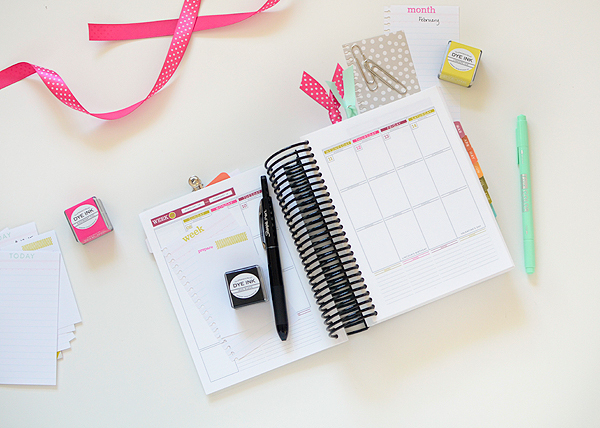 I'm using the planner to stay organized and on task and if I allow myself to go all out and get crazy decorating it, I don't imagine I'll be very productive in other aspects of my life--which is kind of the point of the planner! But the great thing about this system is that I can still incorporate my beloved index cards into it. I used one of the 'Basic Pages' dies to cut spiral edges along the sides, added a few simple stamped headings, and just like that, I'm on track for the day, the week, and even the month. And because I'd rather not add too much extra bulk to this guy, I don't feel badly at all tossing out the old index cards when my to-do list is complete or long-passed. 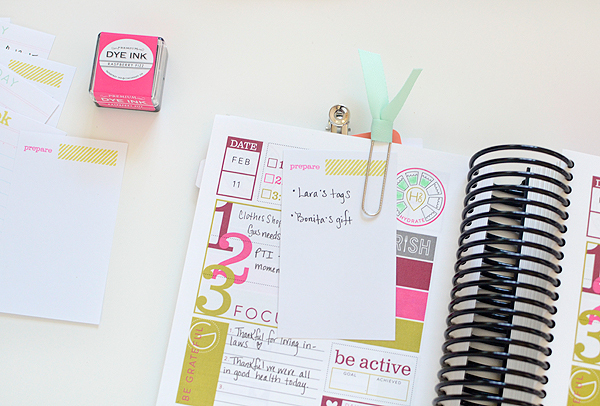 These ribbon paperclips are so easy to make and not only keep loose papers contained in the planner, but they also make it easy to flip between today's date and either my month- or week-at-a-glance. I just clip all the in-between pages together for fast flipping. To make them, I cut short strips (about 6") of ribbon and looped them through one end of the paperclip. All set! One other thing I struggle with sometimes is staying up on Etsy orders and shipping. I always know when an order needs to be shipped, but because I take care to package everything nicely, write a quick personalized note, and add a little extra something to each order, it's not a job I like to leave until the last moment (although, that often happens). So I created some mini white notecards to clip into my planner. Using the "prepare" stamp from 'Planner Banners', I can quickly jot down all outgoing mail that needs tending to so that when I'm ready to go to the Post Office, so are my packages. I have a goal to start thinking more positively this year and a friend of mine was recently talking about how writing down one thing she was grateful for each day helped her change her negative mindset. My initial feeling about Moments Inked is that it's really upbeat. The colors are happy and there is positivity reinforced on nearly every page, from helpful quotes at the beginning of each month, to a full page dedicated to written goals and creating a productive year ahead, to the daily helpful reminders to be grateful. 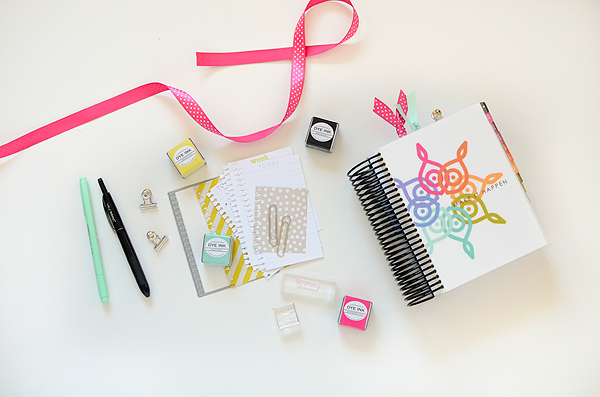 There are a lot of exciting things happening on Nichole Headey's blog today, so be sure to pop over there for the grand introduction of the Moments Inked Planner System and to meet the rest of talented Moments Inked Team! Have a Happy Valentine's Day, friends!! 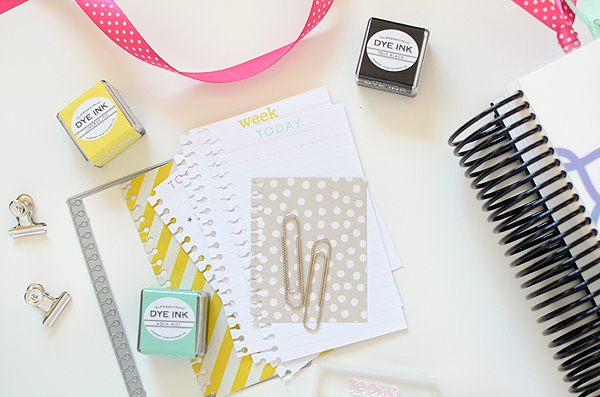 I love your pictures and ideas - especially the ribbon paper clips! So cute! Would you share what kind of pens you are using? Congrats on joining the PTI design family Rebecca! I looked over your blog and Etsy shop (which made me very happy - I'm a nut for great packaging too) and am looking forward to seeing more from you! Congrats on joining the planner team for PTI! Love the ribbon idea. Thank you, Jan! Those paperclips are SO easy to make! I'm also a fan of index cards - thanks for incorporating them into this fabulous system! Looking forward to more of your creativity! 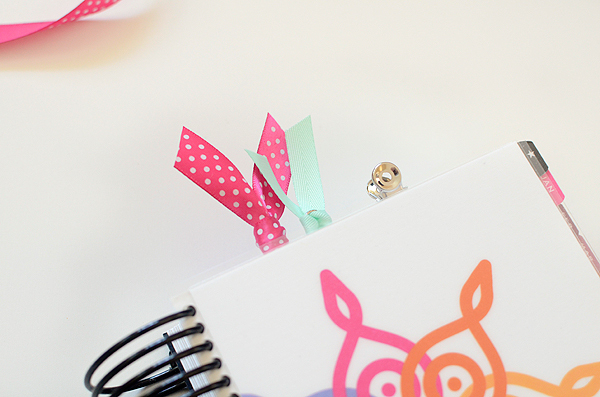 Even with this gorgeous planner, I'm just not ready to let go of my index cards so I had to think of a way to make them work ;) This way they're organized and I don't lose them under a pile of scraps on my desk! Great review and welcome to the PTI family. I will start following y I u on IG and please nudge the others into IG! I follow Ashley and Betsy but the rest do not post. Welcome aboard the team. I know you will be a great asset. That's so kind of you to say, Sandy! I appreciate it! You are the sweetest, Kate! 1000 kisses to you because I was so nervous about joining PTI--in a good way, but also in the kind of anxiety-inducing way because what if their die hard fans are thinking, what the heck is she doing here?! This brand is amazing, though, so there's no way I could say no, right? Best to you and I hope your 3-day weekend is filled only with good things!